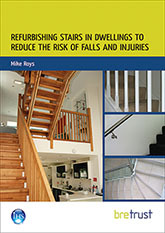 This Information Paper provides guidance to designers and building managers on the best way to assess the types of proprietary nosings that should be provided on non-domestic stairs. It also considers such other factors as secure fastening and colour contrast. Manufacturers can use this guidance to determine potential demand for different types of proprietary nosings and to enable products to be developed that will meet the requirements suggested here. - the size of the going.